Enjoy this beautiful 2 bdrm stylish retreat located in the Exclusive development of COPALA at Quivira, home of the Jack Nicklaus Signature Golf Course. Leave your worries behind while you pamper yourself in this luxurious condo with Mexican marble floors throughout and a fully equipped kitchen with Granite countertops that opens to an al fresco terrace with your own private plunge pool & built in gas BBQ for your personal enjoyment. The master bedroom has King size bed, in suite bathroom and direct access to your private plunge pool, the Jr. master has a Queen size bed & in suite bathroom as well. 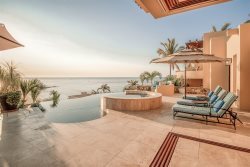 Rediscover Los Cabos with Copala at Quivira and LIFESTYLE Villas.